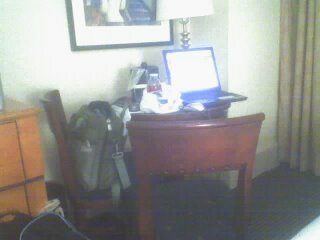 This time my lumpy briefcase feels right at home in our Midtown hotel room. Right at home. No-one would ever accuse this of being a sleek hip boutique hotel. 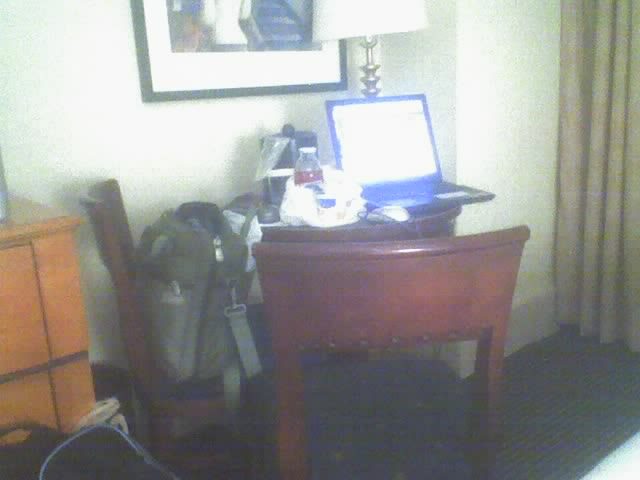 This hotel is as lumpy as my briefcase and just as big, just as neutral-colored, and just as ugly. There are stains on the chairs and the towels are thin and small. I think this was the last hotel room in Manhattan, and for once, economics worked. Supply and demand: the last hotel room is gonna be expensive, no matter how skanky it is. While I was checking in, there was a young Asian man in business clothes shouting at the staff member unlucky enough to be manning the Business Check-in Desk. They'd given away his room. Probably to me. If there's someone willing to pay enough, they'll give away that room you guaranteed on your American Express Corporate Card. Especially if there's a fool who'll pay that exorbitant rate in advance, before they realize what kind of place it is. Gone, daddy, gone. That room of yours is gone: it ran off with someone who was nearsighted enough -- and desperate enough -- to overlook its flaws, its love-handles, its cheap soap, and its peeling wallpaper. I'm not taking off my shoes. No, it's not as bad as the motel in Coalinga, where generations of Central Valley migrant workers had fried pig parts on an illegal hot plate and had left grease stains the size of a human body on the motel room walls. There you really didn't want to take off your shoes. Did you know that mold can actually ascend a shower curtain, much like a rock climber at Half Dome? I would've thought it was just a stylish fur shower curtain, except that it smelled like the fur hadn't gone far from the dog. No, this room is not that bad. This room costs more than fifty times as much as the room in Coalinga, however. What did I expect for that kind of money? I think I expected a hotel room fit for a rock star. It seems as though the rock star -- a second-tier rock star at best, maybe the bass player for RATT or Axl Rose, post-therapy -- had partied all night, destroyed everything that wasn't tied down, and moved on. Checked out. The room shows signs of wear, like not everything's been tidied up and replaced. The view? I'm on the 3rd floor, looking out onto a narrow strip of rooftop. At least there's no dumpster right below me to be emptied at 5am. The wall opposite has nary a window and I can't tell whether or not the sky is cloudy. Internet access is reasonable though (only $11/day) and I really don't mind sleeping with my shoes on. Keeps my socks cleaner. Tomorrow night the room is oddly cheaper -- half of what it is tonight. You get what you pay for. And then some. In this case, you get the ability to sleep indoors and hide from the milling tourists camped in the lobby, shouting at the concierge that they must get tickets to The Wedding Singer. They simply must. Somewhere in Manhattan I'm missing something, something that makes bad hotel rooms worth the extra dough. Somewhere in Manhattan, someone has a nice hotel room and someone's having fun. Me, I think I'll go to sleep. With my shoes on.